Don Quixote de la Mancha There are 33 products. 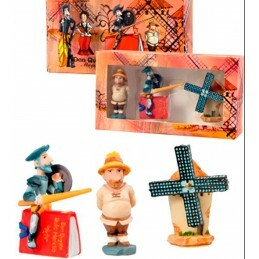 Don Quixote magnets kit, represented the three typical figures: Don Quixote, Sancho Panza and the windmill, beautiful souvenirs from Spain.Presented in decorated gift box. Made of resin. A fun and original memories of your stay in Spain. Size: 6 cm high each figure, box of 8 x 14.5 cm. Metal figure of Don Quixote and Sancho Panza. ZiNGS you present a very cheap souvenir of Spain, perfect as a garnish. We have two sizes. Large : 8.5 cm (Don Quixote) and a base of 6 cm wide. Small : 7 cm (Don Quixote) and a base of 3.5 cm wide. Figure of "Don Quixote" by Creations Nadal. It is a limited and numbered series, and is accompanied by a certificate corresponding to so credited. Made in Spain. Small: 15,00 cm. Large: 22 cm. 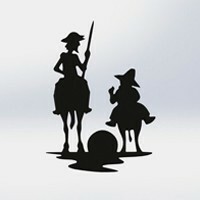 Silhouette of "Don Quixote and Sancho" iron hand made and lacquered, manufactured in Spain. For lovers of Don Quixote by the famous Miguel de Cervantes. It can serve to hang, put desktop or napkin. Handmade by artisan in Spain. It is made to order. Measurements: 22 cm long x 20 cm high x 4 cm Depth. Round ceramic kitchen Mat "Don Quixote" model, it has around one silk cord for hanging in the kitchen and cork underneath for the heat. 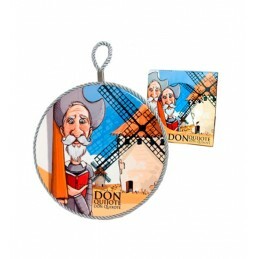 It is used as a support for pots and pans, nice design with images of Don Quixote, a novel from Miguel de Cervantes. Beautiful figure of Don Quixote, the protagonist of the book that wrote Miguel de Cervantes, is made of resin and comes in a sturdy box and well protected to take on your trip. Dimensions: 19 cm x 10.5 cm width book. "Don Quixote and Sancho" unisex adult T-shirt, made of 100% cotton, gray color, perfect souvenir from Madrid and Spain, a tribute to the famous novel from D. Miguel de Cervantes.